Ljubljana overcompensated for its damp first impression by producing sublime spring weather for us to enjoy on our only full day in the city. We spent the day wandering around the city center with its historic bridges and canals as well as enjoying another informative free tour. After working up an appetite getting to know the history of the city, we decided to sample some of its tasty offerings in the 'Open Kitchen' market. It's a weekly outdoor food court of impeccable quality that takes place in the original central market area of the city designed by beloved Slovenian architect Jože Plečnik, who’s work is ubiquitous throughout the country. Energized, we scrambled up the hill to Ljubljana Castle to check out some impressive views from its elevated position. On this crystal clear day the distant Triglav mountain — the highest peak in the country and very much a national symbol — was rendered perfectly in our vision, surrounded by a halo of clouds. Ljubljana has a rich squatting culture. We had the chance to visit a couple of the most prominent squats during our limited time in the city. Pictured here is The Rog: an abandoned bike factory illegally occupied since 2006. It's home to 2 skateparks, a few clubs, cafes, galleries and a social center for disadvantaged populations. 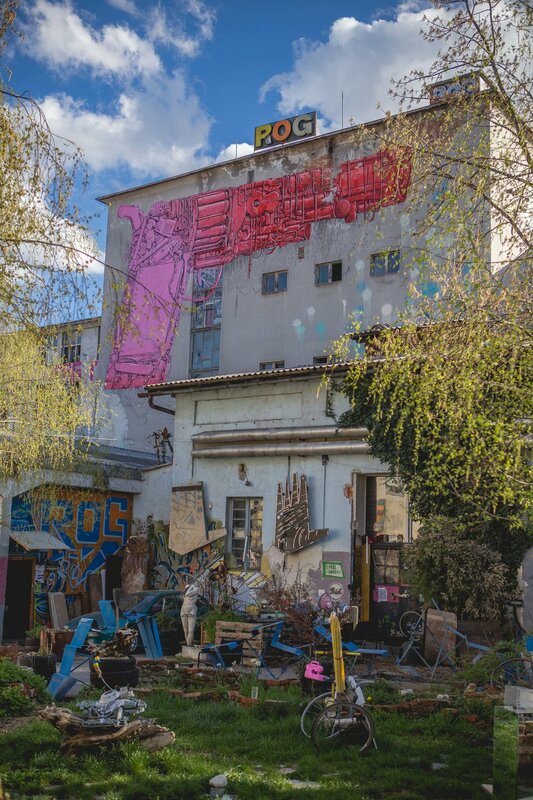 Ljubljana’s largest squat, Metelkova, consists of a grouping of illegally occupied buildings that were once the housing complex of an army base. The base was abandoned shortly after Yugoslavia crumbled (Slovenia happened to make it out of the conflict relatively unscathed; the countries to the south hosted most of the fighting) and, fearing that it would be transformed into some commercial property, Ljubljana activists petitioned that it be used for more creative endeavors. Not able to make any headway legally, artists occupied the buildings illegally and declared Metelkova an autonomous zone in the early 90’s. Now, 25+ years later, the squat is home to a multitude of nightclubs, galleries and alternative events. We were lucky enough to visit Metelkova on a Friday night, which is absolute primetime for subversive activities. We enjoyed a psychedelic rock show in one of the squat’s clubs, while a rowdy punk concert transpired a few doors down. Just over the crumbling, graffiti-clad walls we could see the pristine white cluster of tidy buildings comprising Ljubljana’s Museum District. The juxtaposition of these culture centers, separated only by a small street, was striking to say the least.